Dr. Camille Ward is the President and founder of About Dogs LLC, where she specializes in behavioral consultations and pet dog training. Her philosophy stresses relationship building and working from the dog’s point of view. Dr. Ward received her Ph.D. from the University of Michigan studying cognition and the development of social behavior in domestic dogs. Before that, Dr. Ward’s Master’s Degree focused on how American crows tradeoff the conflicting demands of finding food and avoiding predators. In addition to her work on dogs and crows, she also conducted behavioral studies on primates and fish. Dr. Ward has lectured nationally and internationally at scientific and dog training conferences on dog behavior. She has published on animal behavior in a variety of scientific journals, and her work has been featured on MSNBC, in Cosmopolitan magazine, and in The Bark. 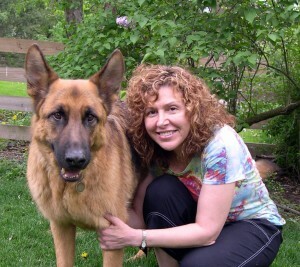 Dr. Ward has taught animal behavior and she designed and taught a seminar called Dog Cognition, Behavior and Welfare in the Department of Psychology at the University of Michigan. Her current research focuses on dog-to-dog communication, cognition, and applied animal behavior. She keeps current with the scientific literature on animal learning and behavior so that the methods she recommends to her clients are based on the latest scientific findings. Dr. Ward is the author of the book Relationship Training for a Well-Behaved Dog, and she is currently working on a Puppy Training Handbook. Dr. Ward received her certification through the prestigious Animal Behavior Society as a Certified Applied Animal Behaviorist (CAAB). The process to achieve certification is selective and rigorous, and it represents the highest achievement available to an academically trained Applied Animal Behaviorist. Dr. Ward is currently serving on the Board of Professional Certification. Dr. Ward is “owned” by a rescue Doberman, Jimmy, a Cavalier King Charles Spaniel, Desi, and a Doberman, Iris. Dr. Ward competes in the dog sport of agility with Desi.